Material:95%Cotton,5%Polyester And Comfortable to Wear. Season: Spring, Summer, Fall.Best Gift for Baby boys.Soft and breathable fabric. Size：6-9months Length 12.5" Bust21.1" Sleeve11.7" Shoulder9.4"
Size：9-12months Length 13.3" Bust21.8" Sleeve12.3" Shoulder9.8"
Size：12-18months Length 14.0" Bust22.6" Sleeve12.9" Shoulder10.1"
Size：18-24months Length 15.2" Bust23.4" Sleeve13.6" Shoulder10.9"
As a mother,I always choose the best for my baby! If you like dinosaur costume,this is a good choice for you! Material:95%Cotton,5%Polyester thin fabric,And Comfortable to Wear. 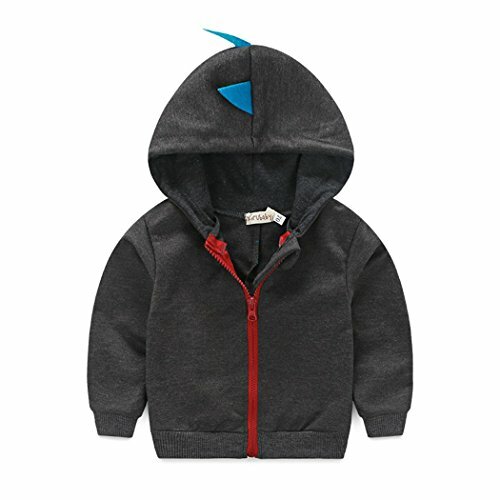 Hooded design,Zipper closure.The cute dinosaur jacket is easy to put on and take off. Size: 6-9 M;9-12M;12-18M;18-24M for Baby Boys,Toddler Boys Sport,Casual,Daily to wear. Season: Spring, Summer, Fall.Best Gift for Baby boys.Soft and breathable fabric clothes. If you have any questions about this product by Dealone, contact us by completing and submitting the form below. If you are looking for a specif part number, please include it with your message.